Koganji Temple Hondo main hall. On the northern and less crowded part of the JR Yamanote Line in Tokyo is Sugamo Station. 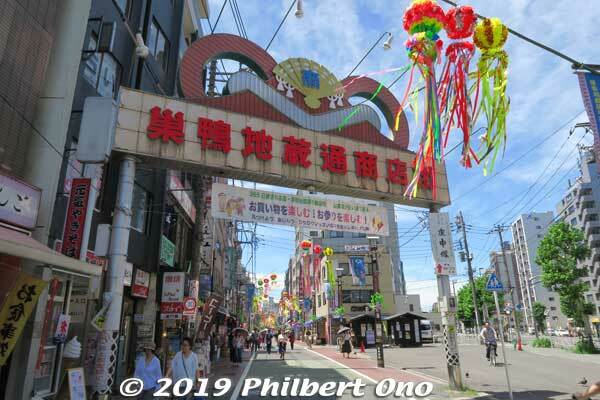 Sugamo is famous for the Jizo-Dori shopping street near the train station. Dubbed the “Grandma’s Harajuku,” Jizo-Dori is supposedly where the elderly do their fashion shopping. Although shops do cater to the older generation, it is also lined with about 200 restaurants, confection shops, and other businesses for local residents. It still feels more like a local neighborhood than a touristy one. Entrance to Sugamo Jizo-Dori shopping street. Jizo statue at Shinshoji Temple, a Shingon Buzan School Buddhist temple. About 800 meters long, Sugamo Jizo-Dori street (巣鴨地蔵通) was named after the large Jizo bodhisattva statue at Shinshoji Temple (眞性寺) at Jizo-Dori’s entrance. Cast in 1714, this Jizo was one of the “Six Jizo of Edo” placed on the main gateway roads from Edo (Tokyo) during the 18th century as a protector of travelers against illness. Sugamo was along the old Nakasendo Road to Kyoto. 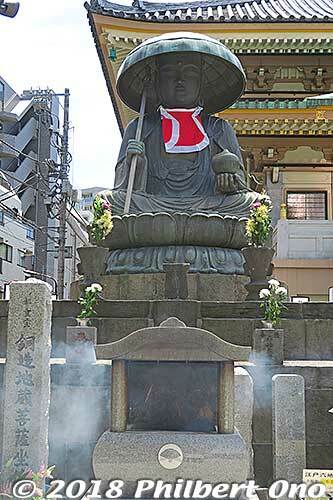 In 1891, another Jizo was added to Jizo-Dori when the famous Koganji Temple moved here. Koganji’s Sanmon front gate built in Sept. 1980. 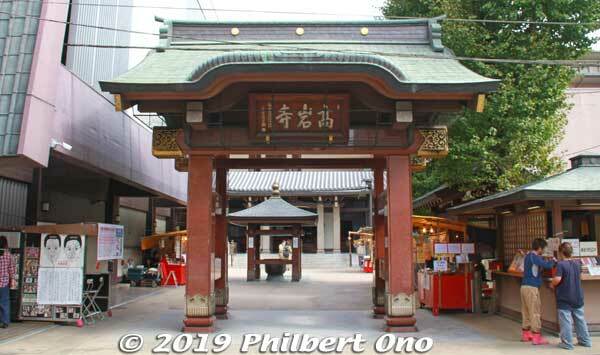 Koganji Temple (高岩寺) is a short walk from the entrance of Jizo-Dori street and Sugamo’s main attraction. Although it’s not a huge nor architecturally significant Buddhist temple, it’s very popular and famous as a healing temple backed by intriguing Jizo stories of health miracles. Koganji is a Soto Zen Buddhist temple with its own congregation, but most worshippers are outsiders. Jizo-Dori and Koganji see 8 million visitors annually. 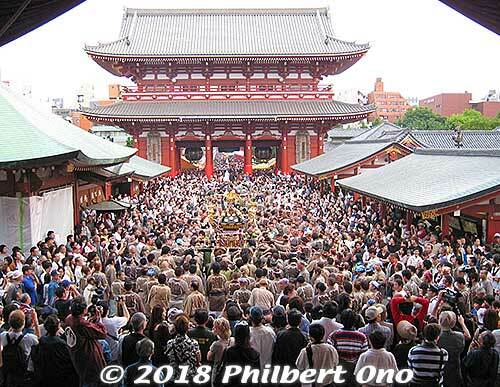 Over 100,000 come on the temple’s Ennichi festival days (縁日) held monthly on the 4th, 14th, and 24th when they have food and souvenir stalls along Jizo-Dori street. The Ennichi festival aims to have people attain a closer connection with Jizo. 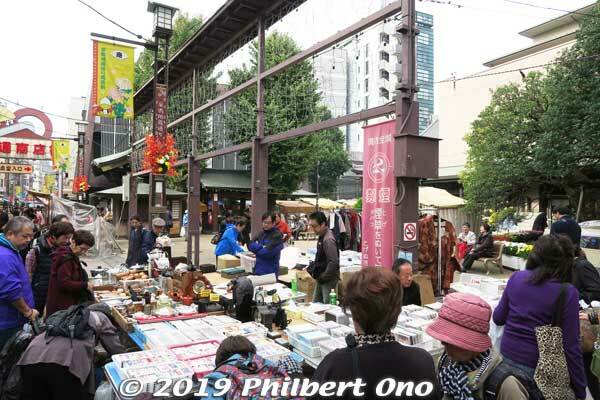 It originated when the temple decided to allow souvenir stalls along the path to the temple to attract visitors since Sugamo was still a backwater when Koganji moved here in 1891. 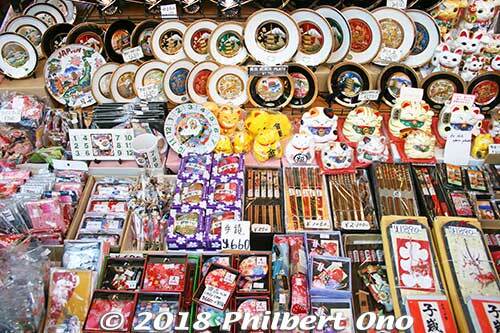 These souvenir stalls morphed into the many shops and eateries now on Jizo-dori street. The temple has nine priests including the head/resident priest and four live-in college trainees who are studying to take over their own temples back home. 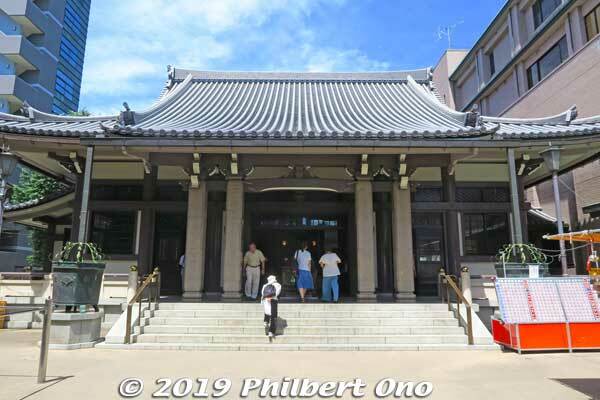 The main temple hall (Hondo) is open from 6:00 am to 5:00 pm (or until 8:00 pm on festival days). 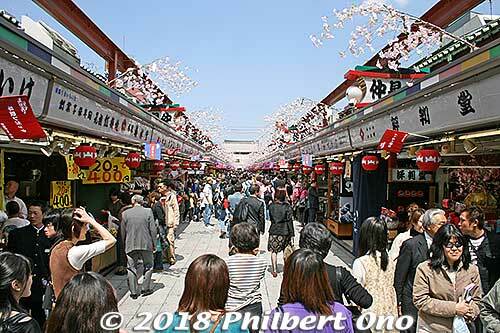 Jizo-Dori shopping street crowded on one of the Ennichi festival days. Souvenir stalls in front of Koganji on an Ennichi festival day. One thing you need to know is that the temple is strictly non-smoking. In fact, the entire Jizo-Dori street prohibits smoking, thanks to the tireless efforts of Koganji’s head and resident priest, Rev. Akinori Kuruma. When I first requested an interview, the first thing he told me before anything else was, “Smoking is not allowed at Koganji. Are you okay with that?” I don’t smoke so it wasn’t a problem. More about him later. 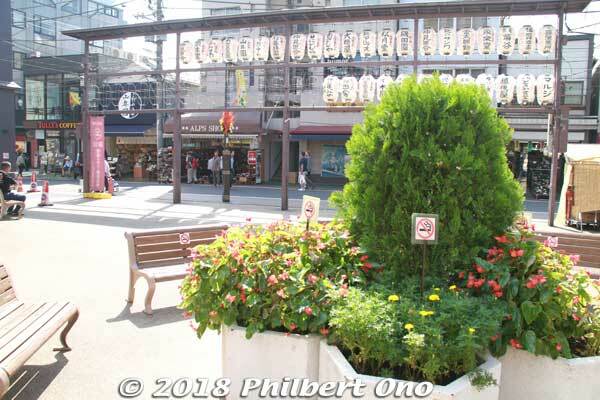 Koganji’s nice public square with benches and “No smoking” symbols. 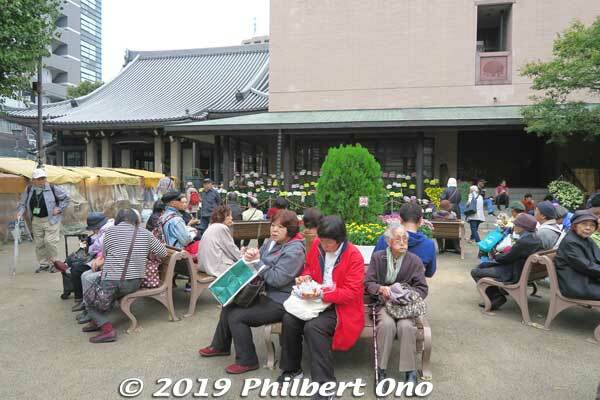 People can take a break and relax at Koganji. Koganji Temple is most interesting for its legends, stories, and beliefs about promoting good health and prolonging human life. It’s what everyone wants, so no wonder it’s such a popular temple. Originally established in Kanda in 1596 as a Soto Zen Buddhist temple, Koganji was consumed by the Great Meireki Fire in 1657 and moved to present-day Ueno where it started to worship Jizo. Due to urban redevelopment, it was later forced to relocate to its present location in Sugamo in 1891. The temple was destroyed during the war in 1945 and the current Hondo main hall was rebuilt in 1958. Koganji Temple’s principal object of worship is Togenuki Jizo. “Togenuki” literally means “thorn extraction,” an attention-grabbing name for a one-of-a-kind Jizo. Surprisingly, Koganji’s Togenuki Jizo is not a statue. And it’s not the stone statue you see people washing right outside the temple hall. Koganji’s thorn-extraction Jizo legend (or truth) starts in May 1713 in Koishikawa, Edo (Tokyo) with the Jizo believer wife of a samurai named Tatsuki (or Tatsuke) Matashiro (田付又四郎). After giving birth to a boy, she fell ill and was near death. Doctors couldn’t do anything. On her deathbed, she confessed that a vengeful spirit had cursed her family so the women in her family would not live beyond age 25. Even her older sister had died at 25. Husband Matashiro kept praying for her until one night a black-robed monk appeared in his dream. The monk told him to imprint a Jizo image on 10,000 small pieces of paper to be floated on the river. When he awoke from the dream, he found a small wooden stamp at his pillow which he used to imprint the Jizo image on the paper. This paper talisman was called “omikage” (御影). While praying, he floated the 10,000 imprinted pieces of paper from Ryogoku Bridge over Sumida River. Next morning, his wife told him that she saw the God of Death being booted out by a black-robed monk with his staff. The wife gradually got better and recovered completely by November the same year. She never got sick again. It was essential to sincerely believe in the healing powers of Jizo, otherwise there would be no miracles. Both the wife and husband were devout Jizo believers. Later, Matashiro talked about his wife’s miraculous recovery at an acquaintance’s house where a Buddhist priest named Saijun (西順) was there. Saijun asked for a Jizo-imprinted omikage paper talisman, and Matashiro gave him two. This priest happened to be a regular visitor to the Edo residence of the famous Mori samurai clan from Choshu (Yamaguchi Prefecture). 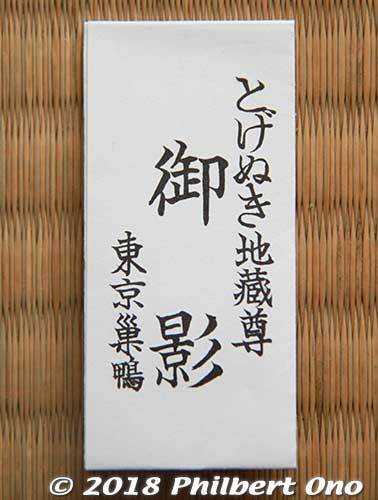 The temple soon started offering these tiny omikage paper talismans imprinted with a Jizo image. Koganji’s miracle stories spread throughout Japan, and small woodblocks were made to imprint the Jizo image on small paper pieces. The ritual of floating 10,000 Jizo paper talismans on waterways spread. Koganji Togenuki Jizo altar area inside the main worship hall. On the left, the small, top chamber keeps the Togenuki Jizo behind closed doors. Small envelope containing the omikage Jizo paper talismans. Koganji’s more visible object of worship is the Arai Kannon (Washable Kannon 洗い観音) standing outside on left side of the Hondo worship hall. People might mistake this as the Togenuki Jizo since it is usually crowded with people and it is an outdoor stone statue like a Jizo. But if you look carefully at the head, it is not shaven. It is a female-like (unisex actually) Kannon statue. You may see a line of people waiting to wash and wipe the Arai Kannon with water and a towel. They are washing the part of the Kannon’s body where they want to heal their own bodies. This popular Arai Kannon originated in 1657 when Koganji Temple member Yaneya Kiheiji (屋根屋喜平次) donated the statue to the temple in memory of his wife who died in the Great Meireki Fire that year. Worshippers eventually started to believe that the part of the statue they washed would heal that part on their own body. They used a hand brush and water to wash the Kannon statue. Over the centuries, the statue became worn and it was finally replaced with a new Kannon statue donated in November 1992 by the late temple patron and Buddhist merchandise seller Nakahori Yoshie (中堀義江) and sculpted by Yatsuyanagi Naoki (八柳尚樹). 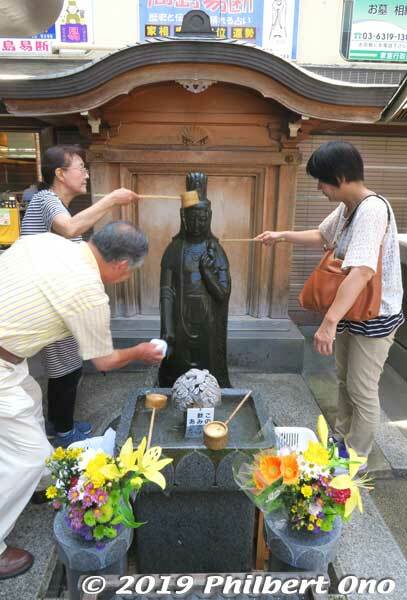 To reduce wear, worshippers now use a towel (sold for ¥100 on site) instead of a brush to wash the Arai Kannon statue. The original Arai Kannon statue is kept in a small chamber right behind the current statue. The face is totally worn out. Rev. 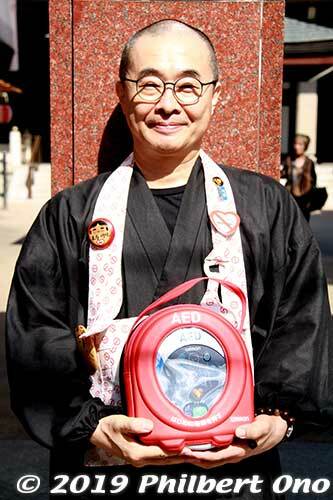 Akinori Kuruma, Koganji’s head priest holding an AED. The next health story is more modern and recent, centering on Rev. Akinori Kuruma (来馬 明規), Koganji’s 29th-generation head and resident priest. A licensed medical doctor specializing in cardiology, Rev. Kuruma graduated from the renown Nippon Medical School in Tokyo and once did research at Emory University in Atlanta, Georgia, so his English is quite good. He originally had no intention to take over the temple from his priest father, but as fate had it, he left the medical profession and became a Buddhist priest in 2005 after his father died. “I wanted to somehow incorporate my medical background in my new occupation,” he says. 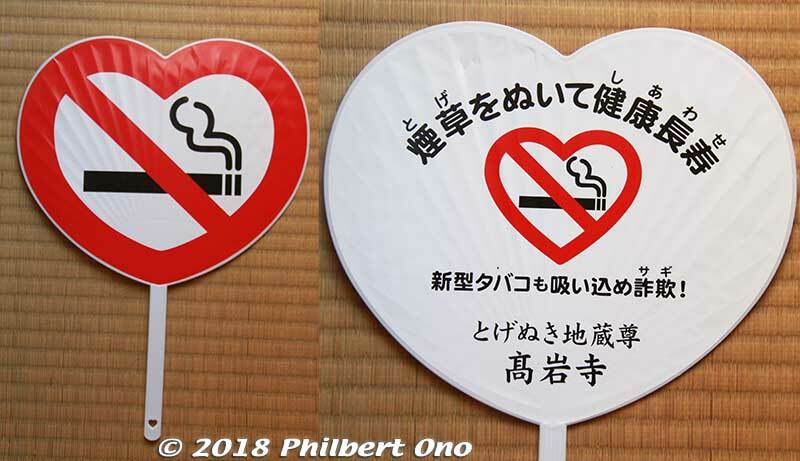 He promptly started a no-smoking movement and pushed for the installation of AEDs (automated external defibrillator) along Jizo-Dori street. Smoking was banned at Koganji, but it took a while to convince the merchants of Jizo-Dori to ban smoking. The restaurants feared that they would see fewer customers if they went smoke-free. 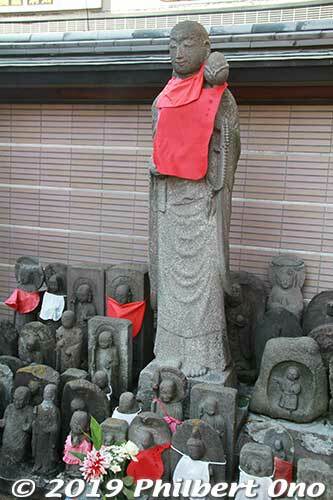 However, as Jizo-Dori slowly went smoke-free, they noticed that more mothers with young children started visiting. That convinced shop owners to go smoke-free and even the tobacco shop was shuttered and cigarette vending machines removed. Rev. Kuruma has done such an admirable job. But outside Jizo-Dori, it’s still an uphill battle against smoking. Rev. Kuruma openly protested against Toshima Ward (where Koganji is located) having an ineffective outdoor smoking area on the east side of Ikebukuro Station in June 2013 even though Toshima Ward had been designated as a World Health Organization-certified Safe Community in Nov. 2012. Also, many priests in his own sect and other Buddhist sects in Japan and around the world smoke as well, much to his disdain. Rev. Kuruma continues to be an anti-smoking activist and lectures all over Japan as a medical doctor and priest about the dangers of smoking and secondhand smoke. Rev. Kuruma was also an early adopter of AEDs in 2005 when they were still rare and not many people knew about it. It was in 2005 when Japan allowed non-medical personnel to also use AEDs. That’s when it started to spread and AEDs were soon installed at Koganji and Jizo-Dori. Jizo-Dori became an AED model case for other shopping neighborhoods that followed suit. In 2007, Koganji started AED/CPR (cardiopulmonary resuscitation) classes at its social hall. Rev. Kuruma is a certified AED/CPR instructor and hundreds of local merchants and residents have taken Konganji’s AED/CPR classes. Word has spread and he also conducts AED/CPR classes for other organizations including Buddhist temples. 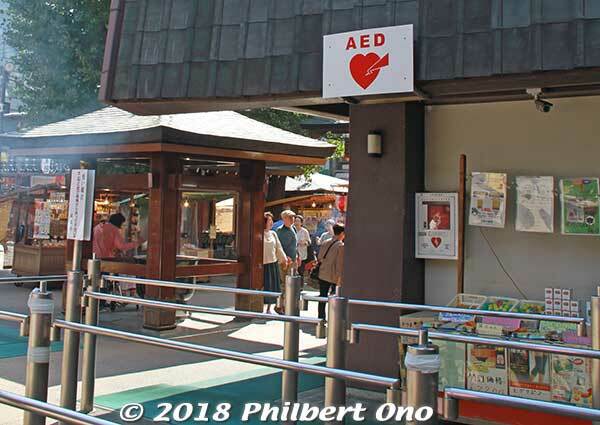 The temple’s AED has even once saved a life or two on Jizo-Dori street. By religiously and medically advocating good health and prolonged life, Rev. Kuruma has really taken Koganji’s mission up to a new level. The temple has become a bastion for good health and longer life. A rare Buddhist temple indeed. Early Morning Prayers every morning at 6:30 a.m.–6:45 a.m. in the temple. New Year’s services (30-min.) on Jan. 1st (6:00 a.m.) and 2nd–3rd (6:30 a.m.). Setsubun Bean-Throwing Festival on Feb. 3rd at 4:00 p.m.
*Special thanks to Rev. Akinori Kuruma for his kind cooperation for this article. 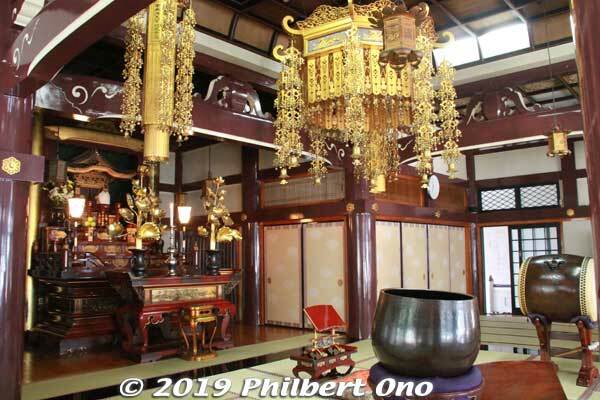 Sensoji Temple’s Hondo main hall. Kaminarimon Gate, symbol of Asakusa (and Tokyo). 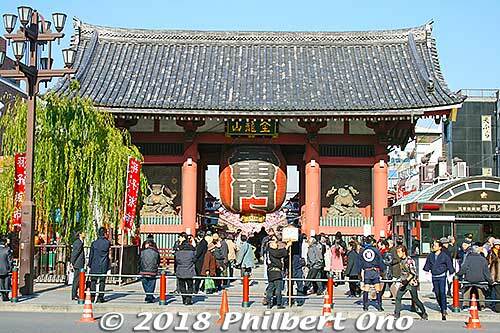 The iconic symbol of Sensoji Temple and Asakusa is Kaminarimon Gate or “Thunder Gate,” the temple’s main gate with a giant red paper lantern. It is one of Japan’s most photographed buildings and a prime spot for “I’m in Tokyo” selfies. Both the gate (rebuilt in 1960) and giant paper lantern were donated by a major Japanese electronics company (Matsushita aka Panasonic). The giant paper lantern can be collapsed from the bottom up to make way for portable shrines, etc., passing through. Bird’s eye view of Kaminarimon Gate, Nakamise, and Sensoji from the eighth floor of the Asakusa Culture Tourist Information Center. Japanese souvenirs galore at Asakusa Nakamise. 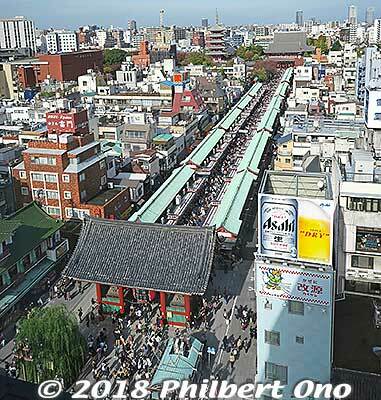 Right after Thunder Gate is the Nakamise-dori path (仲見世通り) of touristy souvenir shops leading to Sensoji Temple. 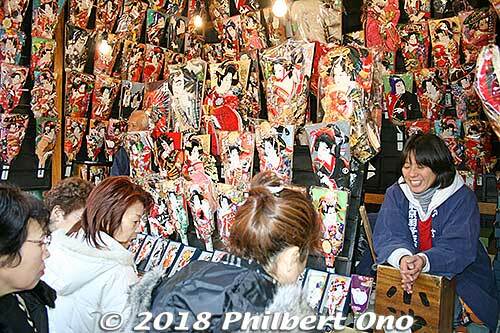 They sell just about all the Japanese trinkets you can imagine, including T-shirts, kimono (yukata), and happi coats. Lots of edible things too, like chestnuts and fried manju. Nakamise ends with Hozomon Gate (宝蔵門) housing another large paper lantern and a pair of Nio guardians protecting the temple. Hozomon Gate (“Treasure Storage Gate”) was reconstructed in 1964 with ferroconcrete. The second floor houses Important Cultural Properties (not open to the public). The back of the gate has a pair of giant straw sandals to scare away evil spirits fearful of the giant guardian the sandals belong to. Back of Hozomon Gate with a pair of giant straw sandals. After Hozomon Gate is the heart of Sensoji Temple (and Asakusa) with the picturesque five-story pagoda and Hondo main hall. Before entering the main hall, you may want to catch some smoke from the incense burner. 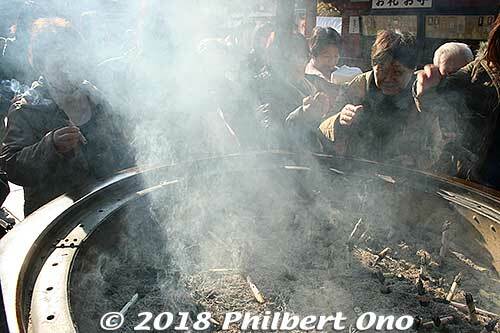 Worshippers scoop the smoke to the parts of their bodies they want to heal. Students studying for entrance exams might fan some smoke to their heads. Incense burner and Hondo hall. Incense can be bought nearby. The main hall has a traditional design, but it was rebuilt in 1958 with ferroconcrete after the previous building from the 17th century was destroyed during World War II. Sensoji’s main hall has been destroyed (by fire, lightning, earthquakes, war, etc.) and rebuilt almost 20 times throughout the centuries. It is Sensoji’s largest building and similar in design to the previous Hondo built in 1649. Inside is a large altar for Kannon (kept hidden), popularly called the “Goddess of Mercy.” It is actually a benevolent, female Bodhisattva. Sensoji used to belong to the Tendai Buddhist sect, but it is now an independent Buddhist temple and sect. Steps to Sensoji ‘s main hall. 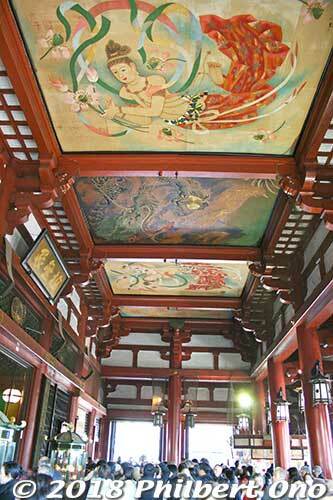 Inside the Hondo main hall, paintings of heavenly beings and a dragon on the ceiling. The five-story pagoda was reconstructed in 1973 with ferroconcrete. The top floor stores some ashes of the Buddha brought from a temple in Sri Lanka in 1966. Its corroding aluminum roof tiles were replaced with titanium tiles in 2017. According to legend, in 628, two fishermen brothers, Hamanari and Takenari Hinokuma, found a golden Kannon buddha statue while fishing in Sumida River. Their mentor Hajinoma Nakatomo recognized the statue’s religious significance, became a monk, and converted his home into a small temple for the statue. 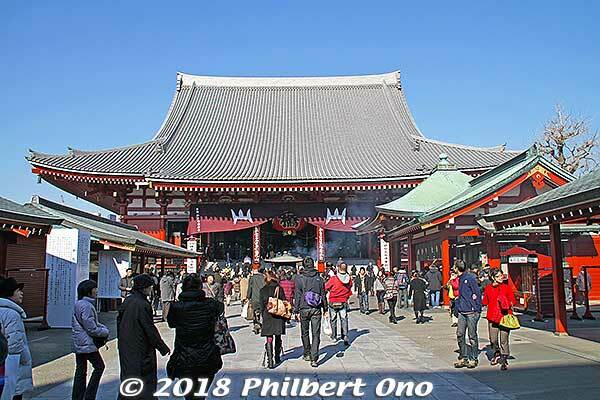 This temple eventually grew to become Sensoji, and Asakusa also developed and prospered. 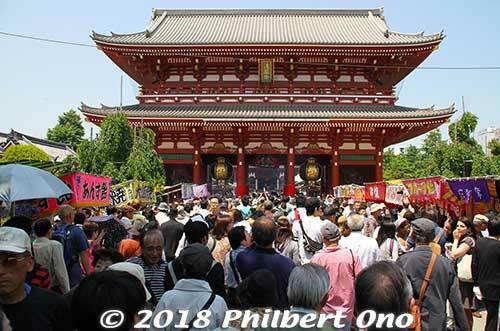 Considered to be the founders of Asakusa, these three men have been deified by Asakusa Shrine (adjacent to Sensoji Temple) and honored annually by the Sanja Matsuri in May, one of Tokyo’s biggest festivals. 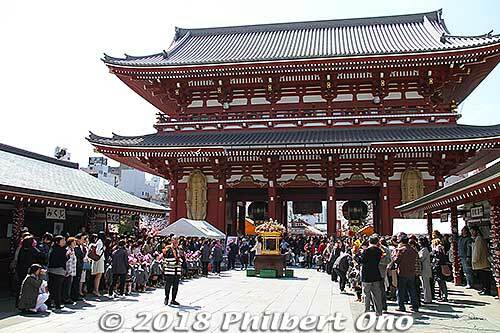 Sanja Matsuri and a portable shrine in front of Sensoji (Hozomon Gate in the background). 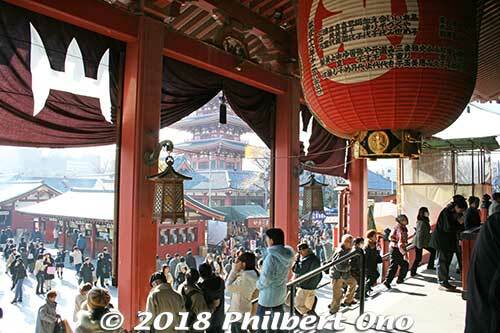 Sensoji’s main hall, pagoda, and Hozomon Gate have been recently reroofed with titanium roof tiles instead of traditional clay tiles. Since the titanium roof tiles can be painted to look like traditional roof tiles, you can’t tell the difference. Titanium roof tiles are much more expensive than clay tiles, but they are much cheaper to maintain due to their high strength, durability, and corrosion resistance to acid rain and salt air. Titanium tiles are also much lighter and smaller than clay tiles to make the building much less top heavy. Top-heavy, Japanese-style buildings are more prone to collapse in a major earthquake. 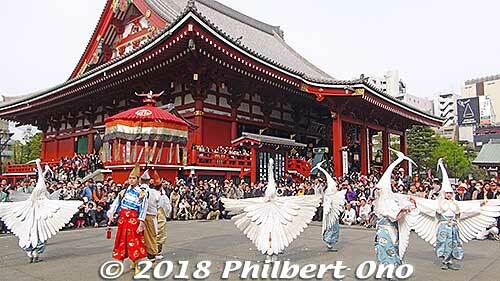 Sensoji and Asakusa hold numerous festivals and events throughout the year. 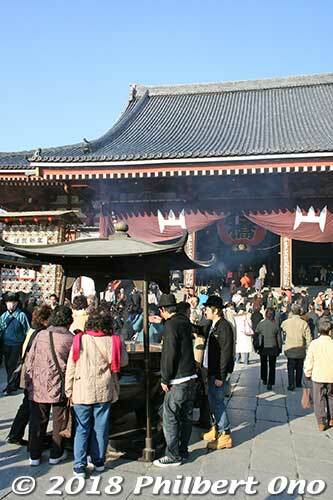 During New Year’s, the temple is crowded with worshippers praying for a prosperous and safe year. 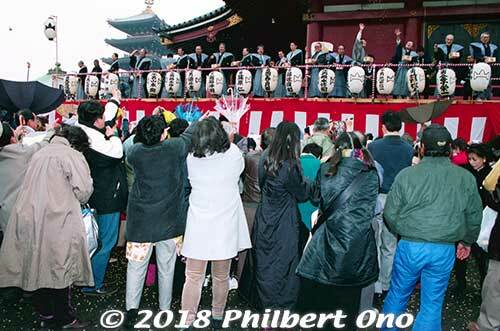 On Feb. 3, there is Setsubun when they throw lucky beans. In April, see the elegant White Heron Dance (Shirasagi-no-Mai), Asakusa Yabusame horseback archery, and Hanamatsuri or Buddha’s birthday. Also in April, in a neighborhood behind Sensoji, the Ichiyo Sakura Matsuri Oiran Dochu is a pretty procession of Oiran courtesans. 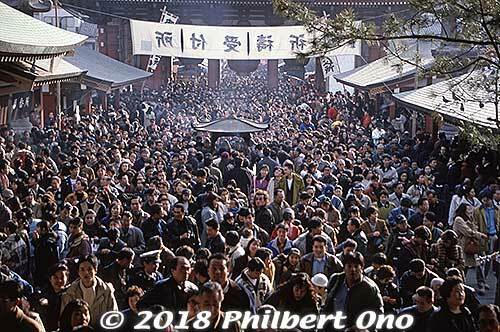 New Year’s worshippers approaching Sensoji. 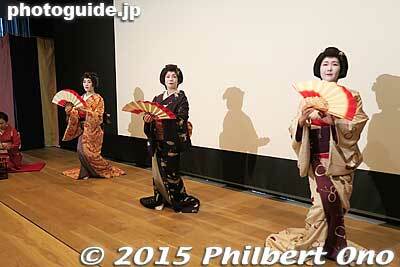 Setsubun bean throwing on Feb. 3. White Heron Dance on second Sun. of April and on Nov. 3. 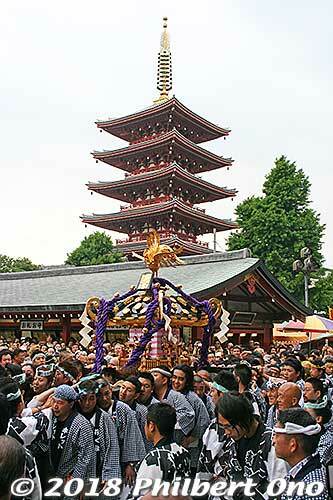 Five-story pagoda and Sanja Matsuri portable shrine passing through in mid-May. 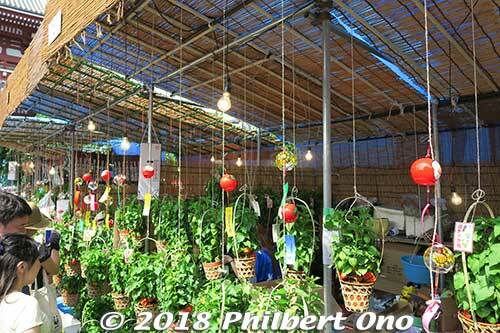 Hozuki Festival Hozuki Ground Cherry Pod Fair in July. Hagoita Battledore Festival in Dec.
Asakusa Geisha Ozashiki Odori dance. When in Asakusa, be sure to visit the Asakusa Culture Tourist Information Center near Kaminarimon Gate and Asakusa Station (Ginza and Toei Asakusa subway lines, Tsukuba Express, and Tobu Skytree Line). 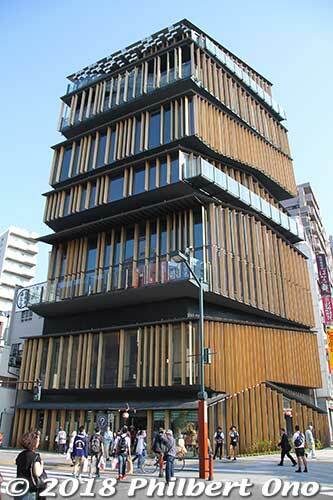 It’s in the distinctive eight-story building designed by Kengo Kuma (who also designed the 2020 Tokyo Olympics main stadium). You can’t miss it. They have English-speaking staff and brochures in English. The eighth floor terrace also gives great views of Asakusa. 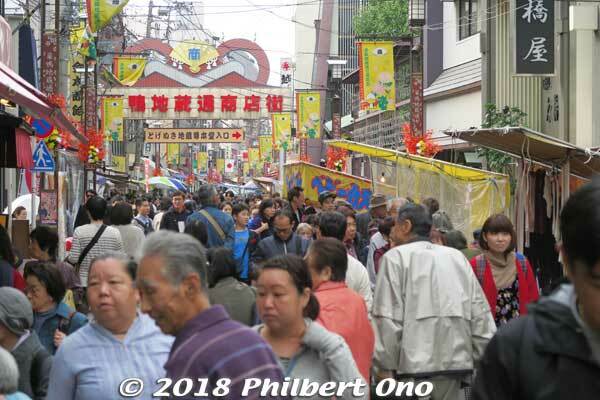 No matter when you visit Asakusa, there’s always something going on. A truly blessed place. 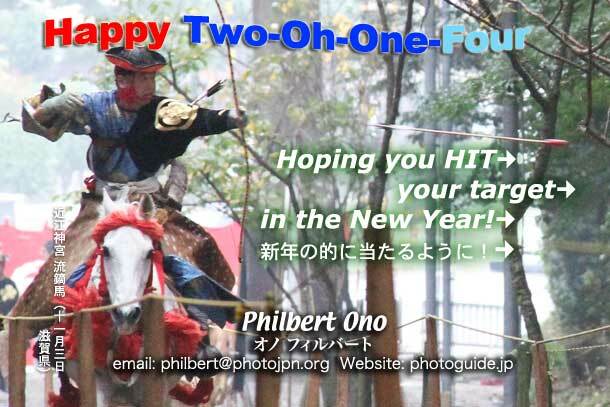 Wishing you all the best in the Year of the Horse!